Lock in a great price for NH Maastricht – rated 8.1 by recent guests! Bartender Aaron was awesome! Very comfortable and amazing location. Spending time for New Year was perfect! Big, well placed TV. Breakfast excellent for gluten- and lactose intolerant guests. The hotel looks a bit old fashioned from outside but it is quite well renovated inside. I guess the renovation was done some time ago and it is noticeable but definitely all facilities are maintained well. The bed was very comfortable. The room is clean and spacy. I had a good sleep. Personnel is extremely friendly and helpful. Much appreciated. Room was comfortable. Perhaps a little too pricey for the type of location. Bar service and staff was great. Food provided was pretty good! Good location near Maastritch town which can walk every day and breakfast is good. We loved our stay at this hotel. The staff was friendly and very helpful, the room was quiet and comfortable. The breakfast was great! They had bacon eggs and all the other breakfast stufff, it definitely is worth the money! The car parking is nice you can go on the street or in the garage both are decent and this place has air conditioning which is amazing for Europe! Definitely worth the money !! Rooms were nice size to American standards and the king size bed was comfortable. Very good air conditioning. Staff very friendly and helpful. Only complaint was that the maides come in to early to the rooms to clean. Not a big problem. Overal I give it 4 stars. Room was great, amazing big bed and nice bathroom! Heating was not working in the room for some reason but a staff member came by and brought us an external heater which worked its charm! Great solution imo. NH Maastricht This rating is a reflection of how the property compares to the industry standard when it comes to price, facilities and services available. It's based on a self-evaluation by the property. Use this rating to help choose your stay! 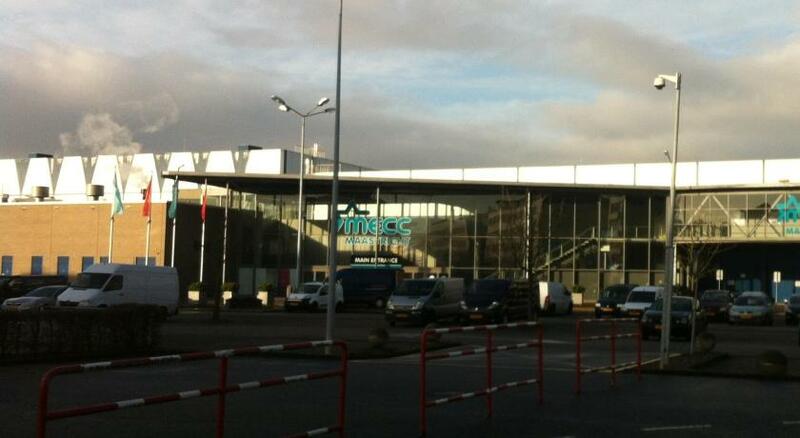 NH Maastricht is on the edge of the historic city, right next to the MECC convention center. It features spacious rooms, an intimate terrace and health center with spa facilities. Free Wi-Fi is available. Cable TV, a work desk and tea and coffee-making facilities are provided in the rooms at NH Maastricht. The hotel is only 950 feet from Maastricht Randwyck Train Station. The hotel is a 10-minute drive from the St. Pietersberg Caves and Het Rijk van Margraten golf course. The health center features a gym and a range of relaxing facilities such as a sauna, solarium and spa tub. For exploring the local area the hotel provides a bike rental and packed lunch services. Seasons Restaurant serves rich cuisine and the menu at The Garden includes elegant lunch and dinner dishes. The Bizonder bistro-bar has high tea during the day and cocktails in the evening. When would you like to stay at NH Maastricht? This spacious room is 28 square yards and includes air conditioning, a mini-bar, coffee/tea making facilities and a flat-screen TV. The private bathroom is equipped with a bath and multiple amenities. Free Wifi is featured. Private parking is available on site (reservation is not possible) and costs EUR 14.90 per day. This spacious room is 24 square yards features a king bed or two single beds. The room is equipped with a mini-bar, coffee/tea making facilities and a flat-screen TV. The private bathroom is equipped with a shower and multiple amenities. Free Wifi is available. This spacious room is 29 square yards and offers air conditioning, a mini-bar, coffee/tea making facilities and a flat-screen TV. In addition, the modern room features wooden floors and plenty of daylight. The private bathroom comes with a bath and multiple amenities. Free WiFi is available. This spacious room is 35 square yards and features a king bed. The room offers wooden floors, a sofa and a coffee table. In addition, the room is equipped with air conditioning, a mini-bar, coffee/tea making facilities and a flat-screen TV. Free WiFi is available. NH Maastricht is a modern hotel with large, fully equipped rooms, next to the mecc congress center and opposite the hospital, 20 minutes walking from the old center of Maastricht. Walk next to the river Meuse, public transport in front of the door. House Rules NH Maastricht takes special requests – add in the next step! ATM card NH Maastricht accepts these cards and reserves the right to temporarily hold an amount prior to arrival. NH Maastricht accepts these cards and reserves the right to temporarily hold an amount prior to arrival. Please note that the paid parking space is part of MECC Convention Center. If you wish to make use of the parking facilities, please go the hotel's reception first and ask for a parking ticket. Please note charges are applicable for the use of the wellness and fitness facilities. It is slightly far from the city center. It was very clean and the staff members were very friendly. Nice restaurant, nice rooms. Overall happy! Given the price of the rooms, they should have been cleaner and more well preserved. Great location! Adjacent to the university and MECC and easy to get to the centre with train and buses; they all stop nearby. Great to have a kettle in the room and a small fridge. I have read other reviews before booking so I had no bad surprises. But, indeed, the hotel (or at least the side where we got the room) was outdated (from bathroom, towels and elevator). In terms of distance, it is a 30-min walk from the center which is OK if you have no trouble with walking. However, it is located in a rather marginal area, so if you come by foot at night, you might want to avoid to be alone. The bed and the silence. Breakfast was decent (except for coffee which really tasted bad for an espresso). The parking, right behind the hotel, is large and almost empty but I felt more comfortable paying the 20 euro/ night fee than leaving the car in the street (and paying a smaller fee). Remarkably noisy - had to change rooms as right by a road. then next room was near the lift - so little sleep. Beds uncomfortable but that may be subjective. Ridiculous hike in prices during TEFAF. Only expensive Superior Rooms have a bath tub. Excellent restaurant menu and impeccable staffing everywhere. Room is tired with flock wallpaper and broken furniture! Service at the front desk was not friendly and a bit slow. One cannot get into the parking garage before check-in. So you would have to find parking in front of the hotel, check in, and only afterwards you are granted access to the garage. The heaters in the room were not functioning properly. Food and service at the restaurant were really great. All staff, except the reception, went out of their way to accommodate us. The rooms were clean and the beds comfy. The breakfast was one of the bests I've ever seen. Very much choice and nicely presented buffet. The rooms are quiet and modern with more than enough space for your luggage. Staff was excellent. Great service with a smile. Hard to think of anything... I gave location 4/5 because it is a long walk to the city centre, but a bus will take you to the hotel from the train station in 10 minutes, and they run every 5-6 minutes. Everything was perfect. The staff was polite and friendly, the room spacious and clean... The breakfast just blew our minds. Restaurant was amazing, didn't get the chance to use other facilities though. It was a while since I was at the hotel, after dinner I had a welcome back tray in my bed, it felt very special. Checking in was rather complicated due to rigidity of the person at the check in desk. In a business hotel it should be possible to have breakfast before 7am. Excellent facilities, friendly staff. Breakfast was the one you expect at a 4 stars hotels.